Having "WeMetCards" and a 'Personal Contact Code' makes keeping in contact easier than ever before! Never lose contact again with friends, classmates, business associates and other contacts. How often have you given someone your handwritten contact information or written down someone's contact information only to have the piece of paper it was written on become lost? People often hand out business cards, but lose contact after changing jobs, phone numbers, email addresses, or relocating. Also, Class Reunion Committees often dread the task of locating classmates they have lost contact with. Well now there's a better way to keep in contact because you not only have an attractive "WeMetCard" which contains your Personal Contact Code to hand out, your current contact information is also online! Anyone you have given your card to can simply go to personalcontactcode.com (a service of Wemetcard), enter your code and obtain your current contact information. Your online Member Page lets you control what information is viewed and it can be updated anytime! When someone visits your Member Page, they can send you an email through the automated system and your personal email address remains private until you give it out. Members can also post personal and/or business information and even upload logos and photos. Click Here to see sample. Designing the back of your card is also quick and easy! Only put the information on your cards you want others to see such as your Name, WeMetCard Member ID, Personal Contact Code and WeMetcard Member Facebook Code, and post any additional information on your Member Page. "WeMetCards" along with the included member services, are also ideal for students who often relocate, graduates who want to keep in contact or anyone seeking employment. Many use cell phone numbers on their resumes as a primary contact number. Just include your WeMetCard Member "Resume Contact Code" (see sample) on your resumes and should your cell phone become lost, stolen or you change your number, any prospective employer can still contact you by going directly to your Member Page to obtain your updated contact information. As a member, you can save hundreds of dollars annually by shopping from the WeMetCard member discount area after you login. Members can also join our FREE Affiliate program and earn recurring commissions, just by telling others about our great member services! 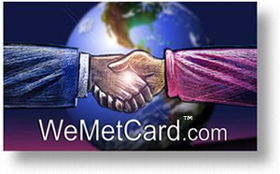 Membership gives you access to ALL Wemetcard Contact Services! Click here to become a FREE WeMetCard member today! Join our Affiliate Program and GET PAID! © Copyright 2006 - WeMetCard - All rights reserved.